Justin Sullivan/Getty ImagesA home burns as the Camp Fire moves through Paradise, California on November 8, 2018. These destructive fires are part of an alarming trend: 12 of California’s 15 biggest wildfires ever have occurred s ince the year 2000. The Camp Fire in northern California has spread so fast that five people were killed in their cars as flames overtook the vehicles. The blaze destroyed the entire town of Paradise, California, and has burned 70,000 acres in less than two days. As of Friday morning, it was just 5% contained. In the southern part of the state, meanwhile, areas of Los Angeles and Ventura Counties have been ordered to evacuate as flames from two fires threaten homes in Malibu, parts of Topanga, and Thousand Oaks (the same city where a gunman killed 12 people on Wednesday). The blazes add to the immense tally of destruction in what was already a record-breaking year of fires in California. In July and August, the Mendocino Complex Fire burned nearly 460,000 acres, making it the state’s biggest wildfire ever. 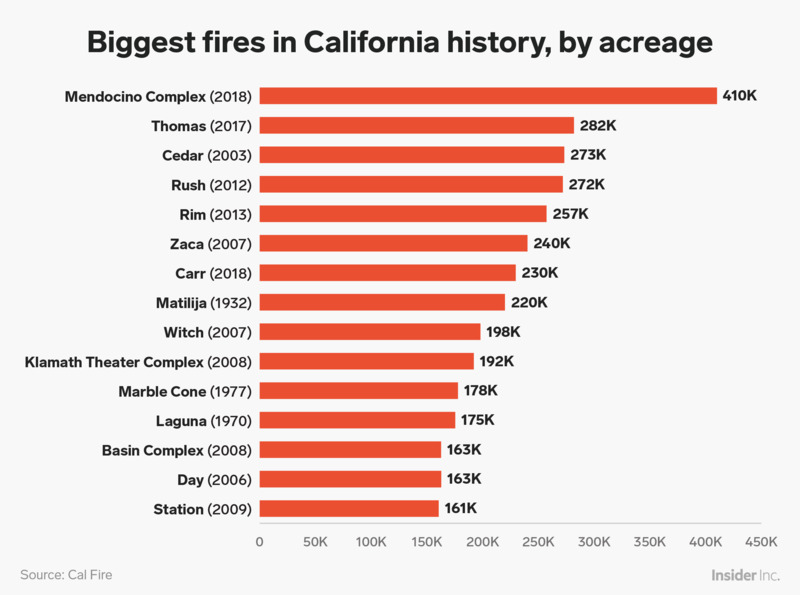 According to an analysis from the nonprofit Climate Nexus, all of these large blazes are part of an unmistakable trend: 12 of the 15 biggest fires in California’s history have occurred since the year 2000. Between 1930 and 1999, there were only six fires that burned over 100,000 acres in California, according to Climate Nexus. 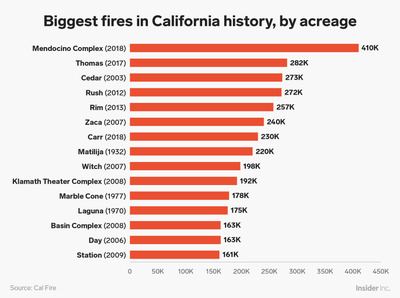 The chart above ranks fires by acres burned, but when comparing the costs of wildfires, California’s October 2017 fires rank at the top. Those blazes scorched grapevines across the state’s wine country and triggered over $US9 billion in losses. Larger blazes also mean an increase in fire-related expenditures. 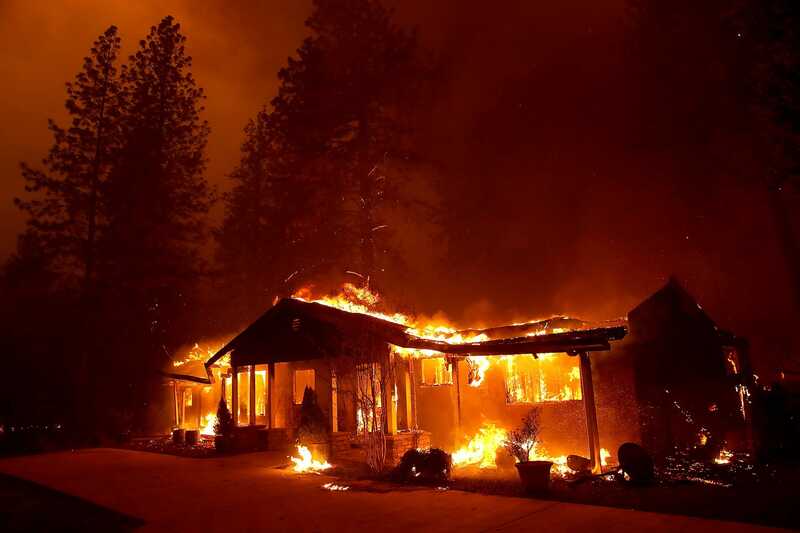 Climate Nexus calculated that in the 2017 fiscal year (which ended in October), California’s Department of Forestry and Fire Protection spent a total of $US505 million fighting fires. Twenty years ago, in 1997, the state spent only $US47 million. Because of rising temperatures and more drought, the average wildfire season now lasts at least 2 1/2 months longer than it did in the early 1970s. The amount of land that has burned in the western US since 1984 is double what would have been expected without the effects of climate change. Last year, Gov. Jerry Brown called the wildfires a “new normal” for California. “This could be something that happens every year or every few years,” Brown said, per the Los Angeles Times. Indeed, California’s 2018 Climate Change Assessment report estimates that the average area burned in wildfires will increase 77% by 2100 in a business-as-usual scenario (as in, if nothing is done to dramatically reduce greenhouse-gas emissions). Although wildfires in the states used to be considered a seasonal risk – due to the state’s rain-less summer and fall and strong Santa Anna winds – that is no longer the case. “Fire season is now year-round,” Los Angeles County’s official website says.